The United States Mint will offer the 2011 American Silver Eagle after three consecutive years of record breaking bullion sales and several tumultuous years for the collector versions of the coin. 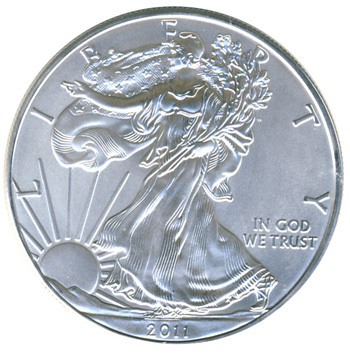 Sales of the 2011 Silver Eagle bullion coins began on January 3, 2011. This represented the first date that authorized purchasers could place orders for the coins. All US Mint bullion coins are distributed through the authorized purchaser network since this is believed to be the most effective and efficient means for distribution to the public. The AP’s buy the bullion coins in bulk quantities and then resell the coins to other dealers and the public, as well as establish a liquid market. For the start of sales, the US Mint reinstated an allocation program, which limited the number of Silver Eagles that each authorized purchaser could buy. Despite the limitations, sales were off to a quick start with more than 4.5 million ounces sold in the first twenty days of availability. This amount represents a new high for monthly sales and signals another strong year of US Mint bullion sales. The US Mint has announced that the 2011 Proof Silver Eagle will be offered for sale by July 6, 2011. In the prior two years, the offering of this popular collector coin has been less than certain. The product was canceled in 2009, and only offered in 2010 for a single month near the end of the year. Recently enacted legislation should improve the availability of the Proof American Silver Eagle in future years. Still undetermined is whether the US Mint will offer the 2010-W Uncirculated Silver Eagle. This collectible uncirculated version of the coin was last offered in 2008. Available directly from the US Mint, the coins are struck on specially burnished blanks and carry the “W” mint mark.